Many other concert and ethnic percussion instruments. Percussionist Beth Gottlieb is a recording and performing artist with over 20,000 concerts worldwide in her 30 years as an AFM member. Beth and husband, Danny Gottlieb, are members of the Lt. Dan Band with actor Gary Sinise, performing fund raising concerts around the world to help build homes for severely wounded US Military, veterans at places like Walter Reed Hospital, Brooks Army Medical Center, The Pentagon and Afghanistan. Beth has also had a very successful career as a Disney recording and live musician. Beth Gottlieb, percussion, is a performer, teacher, clinician, and soloist, whose experience covers the entire musical spectrum. She is a member of the Lt. Dan Band with actor Gary Sinise (Forrest Gump, CSI NY), Principal Percussionist with the Walt Disney World Candlelight Orchestra and Percussionist with many touring artists, shows, and recording projects. She has performed and/or recorded with the Disney Company (The Little Mermaid, Beauty and the Beast and hundreds of sessions of theme park music and a former member of Future Corps, Future World Brass, World Dancers Show Band), Andy Williams, Henry Mancini, Peabo Byrson, Celine Dion, Sammy Davis Jr., Steve Lawrence and Eydie Gorme, Natalie Cole, Shirley Jones, Sandi Patty, Roger Williams, Carol Channing, Kansas, Milton Berle, Henny Youngman, Bobby McFerrin, Chick Corea, Victor Wooten, Muriel Anderson, Johnny Mathis, Steven Curtis Chapman, Gil Evans Orchestra, Eddy Arnold, Donny Osmond, Pat Boone, Petula Clark, Chuck Owen’s Jazz Surge, Jeff Berlin, Lennon Sisters, Mitzi Gaynor, Rita Moreno, Marvin Hamlisch, Tony Bennett, Kansas, Bobby McFerrin, the Irish Tenors, Regis Philbin, Pat Coil and Randy Brecker. 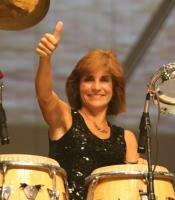 She has also performed on timpani and percussion with dozens of orchestras throughout the south. Beth and husband Danny, "The Gottlieb Duo," perform many concerts and clinics all over the world including Latvia, UK, Norway, Sweden, US, Italy, Germany, Vietnam, Africa and more. They also love performing for children with their educational program, "The Rhythms of Music and Life." Both, as members of the Lt. Dan Band have traveled to Afghanistan, North and South Korea, Japan, Europe, Canada, the UK, Guantanamo Bay, throughout Europe and all over the United States for the USO, including performances at the Pentagon, a Memorial Day television performance and a recent movie, Lt. Dan Band, For the Common Good. Beth has had experience in the world of total percussion, including classical percussion, hand percussion, show percussion, jazz/rock, and rudimental snare drum (She was a snare drummer in Tom Float's award winning Spirit of Atlanta Drum and Bugle Corps). She has also had an extensive teaching career, running the percussion studios at the University of Alabama (Tuscaloosa, AL), Rollins College (Winter Park, FL) and Interlochen Arts Camp, (Interlochen, MI). She holds a Master of Music degree in Percussion Performance and Literature from the Eastman School of Music where she studied with John Beck, and a Bachelor of Music degree in Percussion Performance from the University of Alabama, where she studied with Larry Mathis. Active in music education, Beth has held many offices in the PAS, MENC, MTNA, and FBA organizations, and hosted the PASIC 98 convention in Orlando. Beth also wrote “Masterworks for Mallets” (Row-Loff Productions). She is a clinician/endorser for Ludwig/Musser Percussion, Zildjian Cymbals, Innovative Percussion, Grover Pro Percussion, Offworld Percussion, and the Remo Corporation. Beth is an avid runner, having been featured in Runner's World, Glamour, and Woman's Day magazines.